Need to manage your team schedule or assign work for your field team? 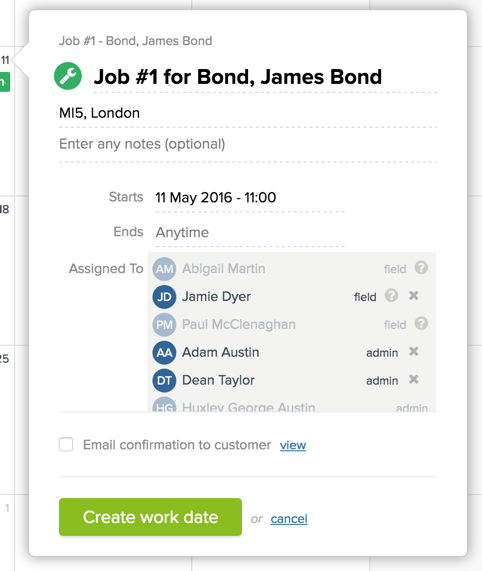 Add field staff to your team in YourTradebase job management software, then schedule and assign work to them. Your field staff can then sign in and view only the work you’ve assigned them. 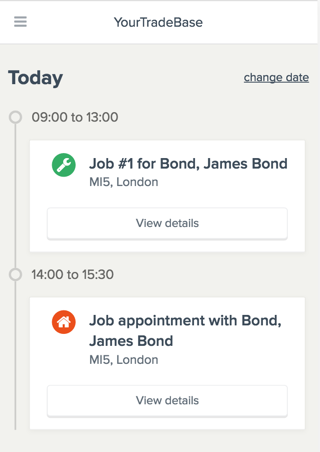 Field staff can see their assigned work details, who the customer is, and the relevant job sheet. But, won’t see any prices and can’t create paperwork. Keep your team organised and on-schedule. Select which field staff members should complete work or attend appointments. Schedule work and see what your team has on. Field staff schedule and job sheets… in their pocket! Field staff sign in on their mobile to view their schedule, work details and job sheets – wherever they are. Field staff can’t see any prices or payment information for jobs they’re assigned to. Soon, your field staff will be able to upload images and write job notes whilst on-site… stay tuned! Start adding your team members today – just visit your Manage team settings to invite them to your account. You can add as many field staff to your account as you need – for just £2.50 per month per field staff. Take a look at how field staff work in YourTradebase with our field staff help guides. Want to find out what can field staff view in your account? Take a look at our guide to field staff permissions.